Organic Old Fashioned Rolled Oats make a delicious, chewy, wholesome hot cereal that will give you lasting vitality throughout the morning. 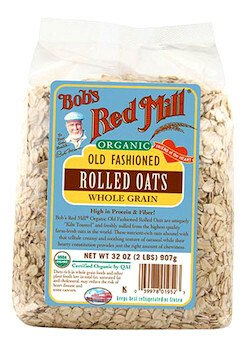 These certified organic oats are also a great choice for classic oatmeal raisin cookies, homemade granola and oatmeal bread. Oats make a great crispy coating; they extend meatloaf and burgers, while enhancing their juiciness; or they can make a savory side dish.